Several years ago, I took a day off from my job at Bose Corporation. Actually, it was a “mental health” day — one of those days where I just couldn’t deal with going to the office, sitting in my pathetic cubicle, and working on something that I didn’t think really mattered. I needed a day to contemplate where my career was headed, and what I should do next. I spent the day wandering around, and later in the afternoon I found myself at the Natick Library. I spent a few hours meandering among the books, and that’s when I saw the book that forever changed my life. 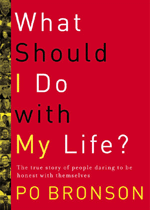 “What Should I Do with My Life” by Po Bronson. The title of the book seemed to be speaking right at me, begging me to pick it up. So I did. Over the next week, I devoured the book. I read the whole book in just a few sittings, and then re-read certain chapters multiple times. During the times I wasn’t reading the book, I was thinking about it. I was fascinated with the personal stories of the people in the book, and I was riveted by the authors commentary. The stories inspired me. Noah, who wanted to teach golf. The Toner Queen who finally branched out on her own. Heidi, the Boom Wrangler. And on, and on. Each story, raw in its reality, was linked together by the artful weaving of this brilliant writer. Together the stories made a quilt, and I was completely wrapped up in it. When I read that passage, I remember saying out loud, “Did Po write that for me?” With his words, he seemed to know what I had been thinking and my ongoing struggle. What should I do with my life? How can I start doing everyday what I want to do? This wonderful book changed my life. Although it took me more than a year, I finally faced up to what I really wanted to become. I want to be an entrepreneur! I want to start a company! I didn’t know what I wanted the company to do, and I had no idea how I was going to figure it out. But Po’s book gave me the courage to start down the path even though ALL of my notions were muddled and vague. One can argue that there is no greater success in life than changing someone else’s life. I hope that I someday get the opportunity to tell Po just how much he changed mine. I bet he’s heard that before, but I hope he never gets used to it. His gift of words and thoughts forever impacted who I am, and who I’ll still become. I’m going to send Po this blog post, and I hope that he feels my words jump off this page. And I hope he’ll wonder over to Punchbowl.com and take a look. I’m proud to say that I’m an entrepreneur, and I’m doing what I want to be doing. Maybe someday Po will do a second book — and chronicle all of the people who were inspired by his initial book and the resulting impact it’s had on the world. Take Punchbowl as one example: we’ve raised millions of dollars in capital, we employ a couple dozen people, and millions of consumers have used our site to plan hundreds of thousands of celebrations. None of this would have happened without Po’s book. Thank you Po. Thank you. My favorite story from that book was the auditor (was it Po himself, or a story? I forget) whose job was to sit in front of a spreadsheet all day, make sure that column A plus column B equals column C. And if it does, make a checkmark in column D. All day long.So, he started up a greeting card business. From the office. Using office supplies. And, 5 minutes before the end of the workday each day, he'd go down column D and go "check check check check check check…"Years ago when I read that I was all "OMG! What if one of those checks was wrong!?" But in the years since, I've told that story repeatedly as an example of "Go for it, what's the worst that could happen?"